Thailand's third largest island, Koh Samui was little more than a whisper among backpackers until 1989—when Bangkok airways opened a private airport. Today, you'll find quaint low cost bungalows holding strong amongst some of the most exclusive resorts in the world. Wild reggae pubs, fine dining restaurants, bustling city beaches, and completely empty stretches of sand… it's all there. Samui's rainy seasons are from October to December, the best time to visit is from February to April. Forget walking. 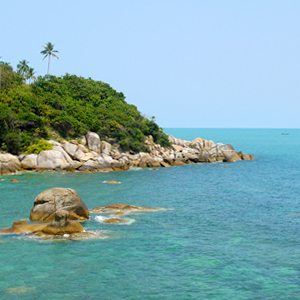 Take a plane from Bangkok to Samui via Bangkok Air (which owns rights to the Samui Airport.) Alternatively, you can take a car, bus, train, or smaller airline to Surat Thani where you can cross over by ferry. W5 Magazine letter regarding the recent flood and airport closure. Traditional candy, imported New York recipes, and Octopus Stew? Eat up, food lovers.